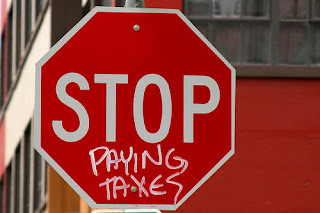 Almost every person knows the old saying, “nothing is certain but death and taxes.” It’s usually preceded by a heavy sigh and a feeling of helplessness as the leper-hand of the government reaches into their pocket and steals their hard-earned money… and that is exactly what an income tax is: legalized theft. I can’t walk to my neighbor’s house, demand that he gives me half of his paycheck, and lock him up in my basement if he refuses. Why, then, is it okay for the government to do exactly that? Some might say that the government will put the money to good use: schools, emergency services, welfare, etc. Yet all of these things can be (and are, in many places) privately managed – almost always at a lower cost and with better results. Anyone with a brain can see how much money is wasted by our government (to the tune of a $1 trillion deficit every year). Even if we taxed every person in the country at 100% of their income, the U.S. government would still be in debt. The point is, regardless of what the government plans to do with our tax dollars, the money would always be put to better use by the individuals that earned it. Why? Because only that individual is aware of his/her exact needs and desires, which is something the government can never account for in a country of 315 million people. What about the less fortunate? Here’s an interesting fact: statistically, Americans are the most generous people on earth. On average, we donate more than twice as much of our hard-earned money to charity compared to the outrageously-taxed Europeans. Without government welfare, people could bypass the wasteful bureaucracy and greedy politicians and instead give that money directly to the people that need it. More to the point, what right does one person have to another person’s earnings? Absolutely none, unless that person freely chooses to give. Otherwise the government is stealing bread from one person’s mouth to give it to another, often while taking a few bites to satisfy itself! Ultimately, one can only “justify” taxation with the awful, ignorant idea that “might makes right.” The government has the power, but not the right, to steal our money before we even get our paycheck. The average Federal Income Tax-paying American (about 53% of the country) works 5 months out of the year just to pay their taxes. If they refuse, they’re thrown in jail. The implication of an income tax is that the government owns all the money you earn, and only allows you to keep a portion of it. How dare we do as we please with our own money!? With an income tax rate of 0%, jobs would flood the country. Consumer spending and charitable donations would skyrocket to unheard-of levels. Most importantly, the Federal government would have to live within its means like the rest of us and scale itself back to its Constitutional limits. The less government we have, the freer we are. That’s why there IS an income tax: it’s a form of control. What better way to rule us than by stealing everything we produce?